Renal angiomyolipoma (AML) is a benign neo-plasm composed of thick blood vessels, fatty tissue and smooth muscle cells. , Most cases of renal AML present as an isolated lesion while approximately 20% of patients have an association with the tuberous-sclerosis complex (TSC) and other phacomatoses such as neurofibromatosis. ,, Renal AMLs asso­ciated with TSC tend to be multifocal, bilateral and larger. These lesions are more prone to rupture and tend to be symptomatic rather than the isolated lesions. , Renal AMLs are hor­mone-sensitive tumors. ,,, Moreover, pregnancy induces tumor growth and rupture. In this report, we report a case of renal AML asso­ciated with TSC who was admitted to the hospital for spontaneous rupture of a giant pseudoaneurysm, which had occurred as a complication of AML, following pregnancy. The patient was successfully managed with emergency endovascular embolization. A 25-year-old puerperal female patient was admitted to an outside hospital with a sudden onset of abdominal pain, dizziness and fatigue. She had delivered a baby two weeks earlier. She was hypotensive (around 70/40 mm Hg) and had tachycardia with a heart rate over 120/min. A diagnosis of hypovolemic shock due to blood loss was made on the basis of a drop in hemoglobin level to 8 g/dL from 14 g/dL two to three weeks earlier. Abdominal ultra­sonography (US) revealed bilateral renal le­sions suspicious of AMLs and a giant cystic mass originating from the lower pole of the left kidney. Subsequent computed tomography (CT) of the abdomen revealed a giant pseudoaneurysm originating from the lower pole of the left kidney with a diameter of 12 cm × 15 cm [Figure 1]. The patient was immediately referred to our hospital for possible endovascular treatment. Figure 1: Abdominal computed tomography images obtained at an outside hospital showing giant pseudo-aneurysm originating from the left kidney. Multiple hypodense lesions are also seen suggestive of renal angiomyolipomas. In our hospital, the patient was taken to the angiography unit and abdominal aorta and selective renal artery injections were obtained. Abdominal aortography demonstrated contrast extravasation from the left segmental renal artery [Figure 2]. 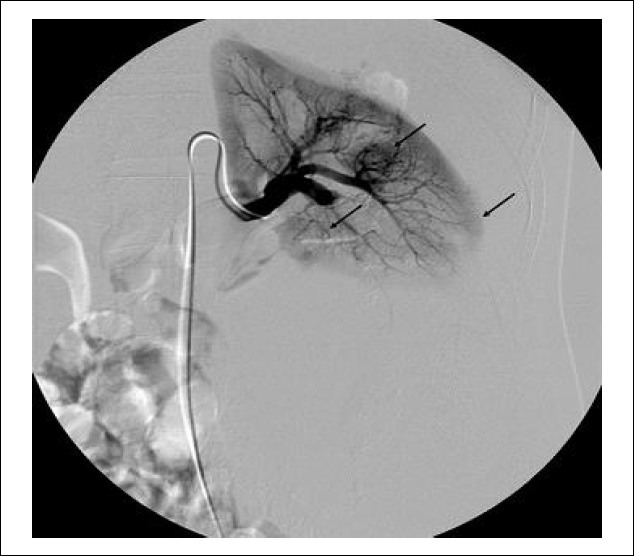 Subsequent selective left renal artery injections confirmed the diagnosis of giant pseudoaneurysm arising from the segmental branch of the renal artery [Figure 3]. Using a micro-catheter, this segmental artery was embolized with 33% diluted n-butyl cyanoacrylate (nBCA), avoiding filling the sacitself [Figure 4]. 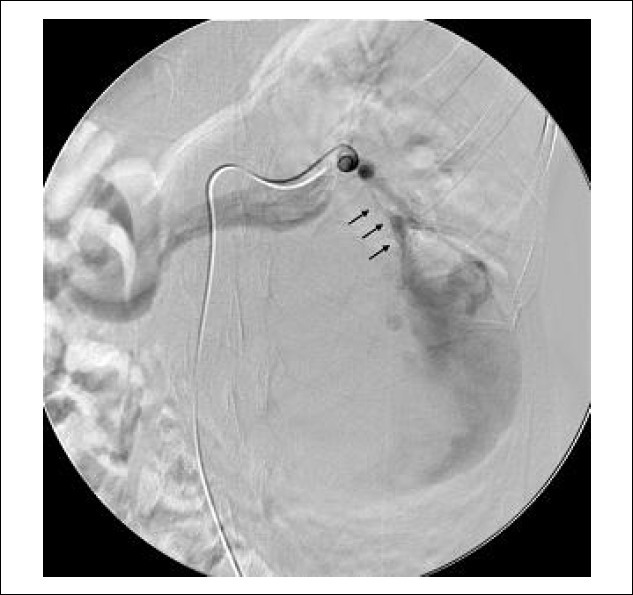 Folio-wing this, control angiography documented no further filling of the pseudoaneurysm sac and approximately 90% of the left renal parenchyma was pre­served [Figure 5]. 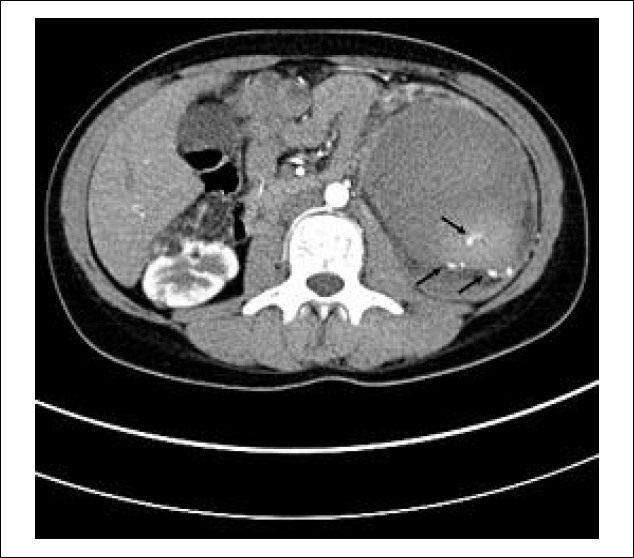 Six weeks after the proce­dure, follow-up abdominal CT showed throm­bosed pseudoaneurysm with no evidence of active bleeding. Also, the diameter of the sac had decreased from 15 cm to 10 cm [Figure 6]. The patient is on regular follow-up and is doing very well. Figure 2: Abdominal aortogram showing filling of the giant pseudoaneurysm located in the left lower quadrant of the abdomen. Also, note the intestinal gas displacement to the right lower quadrant. 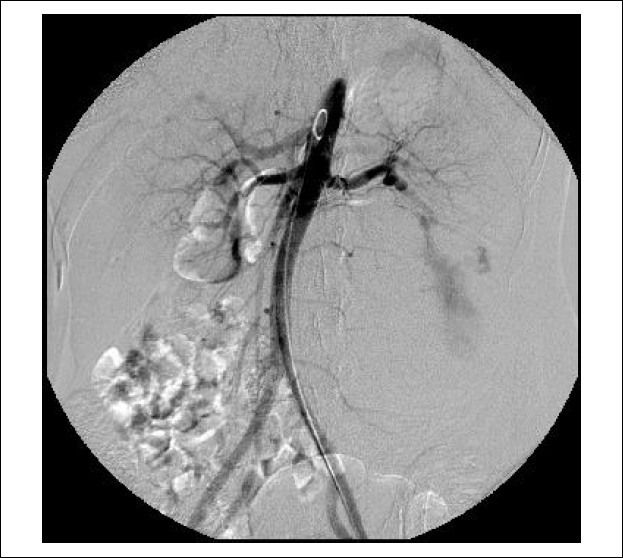 Figure 3: Selective injection into the left renal artery showing the segmental renal artery branch directly opening into the giant pseudoaneurysm (arrows). 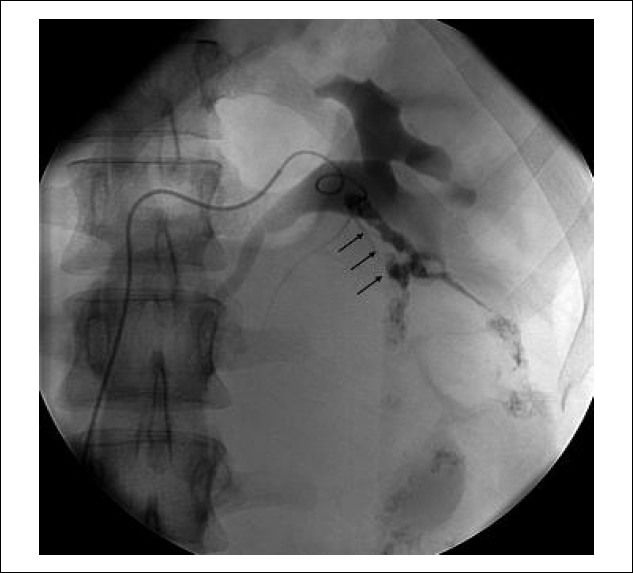 Figure 4: Scout film after nBCA embolization demonstrating the glue cast filling the segmental artery (arrows). Figure 5: Selective left renal artery injection after endovascular treatment demonstrating the mostly preserved left kidney with other smaller AMLs (arrows). Figure 6: Six-week follow-up computed tomography image showing significant decrease in diameter of the totally thrombosed pseudoaneurysm in the left kidney. Also, note some hyperdense glue foci (arrows) within the aneurysm sac representing distal emboli during proximal parent artery embolization. The patient in this report was completely asymptomatic until the time of pregnancy. Sebaceous adenomas on her face did not draw any attention until the diagnosis of bilateral renal masses was made. Therefore, the diag­nosis of TSC was made only after bleeding occurred from the renal AML, most likely triggered by pregnancy. In conclusion, spontaneous rupture of renal AML should be suspected in a puerperal patient with sudden onset of abdominal pain and hypovolemic shock. CT imaging should be the diagnostic tool of first choice. We suggest that trans-catheter embolization should be considered in high-risk patients with renal AML as the first therapeutic option to prevent the growth and spontaneous rupture of the lesions. Because renal failure is the most common cause of death in patients with the TSC, selective transcatheter embolization can be helpful both for preserving the renal functions and for preventing catastrophic complications. 1. De Luca S, Terrone C, Rocca Rosseti S. Manage­ment of renal angiomyolipoma: A case report of 53 cases. BJU Int 1999;83:215-8. 2. Jou YC, Chen WP, Huang CL. Urgent angioembolization with early elective nephron-sparing surgery for spontaneously ruptured renal angio­myolipoma. J Chin Med Assoc 2009;72:450-2. 3. Bora A, Soni A, Sainani N, Patkar D. Emergency embolization of bleeding renal angiomyolipoma using polyvinyl alcohol particles. Diagn Interv Radiol 2007;13:213-6. 4. Steiner MS, Goldman SM, Fishman EK, Marshall FF. The natural history of renal angio­myolipoma. J Urol 1993;150:1782-6. 5. Nelson CP, Sanda MG. Contemporary diagnosis and management of renal angiomyolipoma. J Urol 2002;168:1315-25. 6. Blute ML, Malek RS, Segura JW. Angyomyolipoma: Clinical metamorphosis and concerns. J Urol 1988;139:20-4. 7. Harabayashi T, Shinohara N, Katano H, Nonomura K, Shimizu T, Koyanagi T. Management of renal angiomyolipomas associated with tuberous sclerosis complex. J Urol 2004;171:102-5. 9. Wright T, Sooriakumaran P. Renal angiomyolipoma presenting with massive retroperitoneal haemorrhage due to deranged clotting factors: A case report. Cases J 2008;4:213. 10. Yamakado K, Tanaka N, Nakagawa T, Kobayashi S, Yanagawa M, Takeda K. Renal angio­myolipoma: Relationships between tumor size, aneurism formation, and rupture. Radiology 2002;225:78-82. 11. Unlu C, Lamme B, Nass P, Bolhuis HW. Retroperitoneal haemorrhage caused by a renal angiomyolipoma. Emerg Med J 2006;23:464-5. 12. Yip KH, Peh WC, Tarn PC. Spontaneous rupture of renal tumours: The role of imaging in diagnosis and management. Br J Radiol 1998;71:146-54. 13. Rimon U, Duvdevani M, Garniek A, et al. Ethanol and polyvinyl alcohol mixture for transcatheter embolization of renal angiomyolipoma. AJR Am J Roentgenol 2006;187:762-8. 14. Dabbeche C, Chaker M, Chemali R, et al. Role of embolization in renal angiomyolipomas. J Radiol 2006;87:1859-67. 15. Han YM, Kim JK, Roh BS, et al. Renal angiomyolipoma: Selective arterial embolization-effectiveness and changes in angiomyogenic components in long-term follow-up. Radiology 1997; 204:65-70. 16. van Baal JG, Smith NJ, Keeman JN, Lindhout D, Verhoef S. The evolution of renal angiomyolipoma in patients with tuberous sclerosis. J Urol 1994;52:35-8. 17. Kennelly MJ, Grossman HB, Cho KJ. Outcome analysis of 42 cases of renal angiomyolipoma. J Urol 1994;152:1988-91. 18. 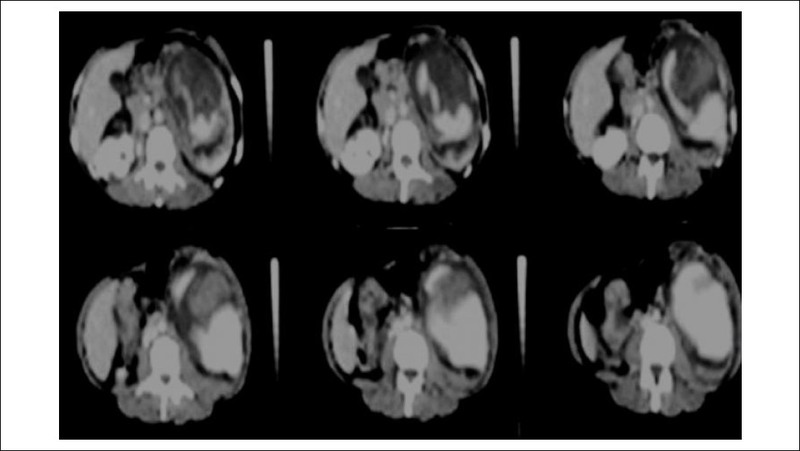 Earthman W, Mazer M, Winfield A. Angiomyo­lipomas in tuberous sclerosis: Subselective embolotherapy with alcohol, with long-term follow-up study. Radiology 1986;160:437-41. 19. Casper KA, Donnelly LF, Chen B, Bissler JJ. Tuberous sclerosis complex: Renal imaging findings. Radiology 2002;225:451-6. 20. Chonco AM, Weiss SM, Stein JH, Ferris TF. Renal involvement in tuberous sclerosis. Am J Med 1974;56:124-32. 21. Narla LD, Slovis TL, Watts FB, Nigro M. The renal lesion of tuberosclerosis (cist and angiomyolipoma); screening with sonography and computerized tomography. Pediatr Radiol 1988; 18:205-9. 22. Martinez Barcina MJ, Quintian Schwieters C, Bonnin Sanchez D, Alberola Bou JM. Intratumoral pseudoaneurysm: Atypical radiologic manifestation of bleeding from an angiomyolipoma. Radiologia 2008;50:79-81. 23. Gaikwad AB, Madathil MB, Kothari AS. Giant renal angiomyolipoma with fatal hemorrhage due to a large pseudoaneurysm. J Clin Ultrasound 2008;36:174-6. 24. Ewalt DH, Diamond N, Rees C, et al. Long term outcome of transcatheter embolization of renal angiomyolipomas due to tuberous sclerosis complex. J Urol 2005;174:1764-6.